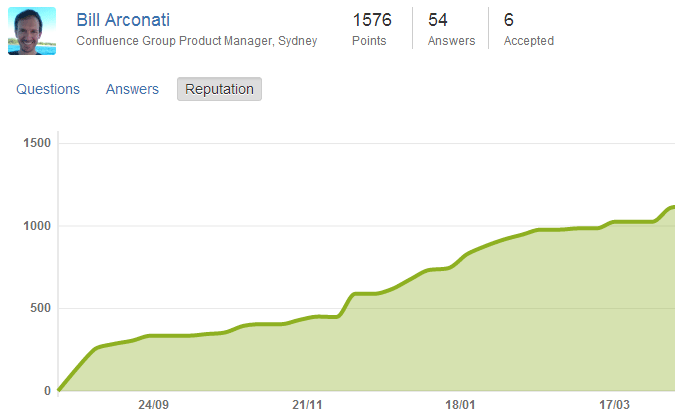 If you have JIRA and Confluence we have another new chart type for you. The two dimensional chart is a matrix style chart for showing issue statistics. You can configure the X and Y axis to show issue status, priority, type, assignee and more. Its now easy to see your recently viewed Confluence pages on mobile. Tap and choose Recently Viewed. You can now see a user's reputation over time as a graph. Click the user's name then click Reputation to see the graph. You can now @mention people in comments. Links are clickable too.